The Madonna and Child or The Virgin and Child is often the name of a work of art which shows the Virgin Mary and the Child Jesus. The word Madonna means "My Lady" in Italian. Artworks of the Christ Child and his mother Mary are part of the Roman Catholic tradition in many parts of the world including Italy, Spain, Portugal, France, South America and the Philippines. 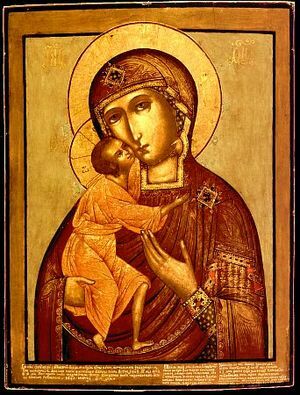 Paintings known as icons are also an important tradition of the Orthodox Church and often show the Mary and the Christ Child. They are found particularly in Eastern Europe, Russia, Egypt, the Middle East and India. 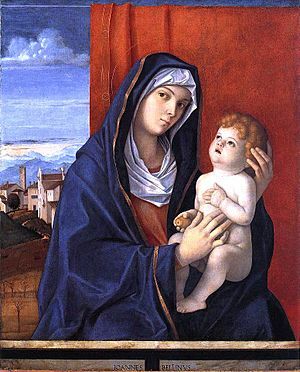 by Giovanni Bellini, c.1500, Venice. Works of art which show the Madonna and Child can be paintings or sculptures. Some paintings are very large and show the Madonna on a throne, with saints standing around it. These paintings are altarpieces; they are designed to go above the altar in a church. In some churches, particularly in Italy and in Eastern Orthodox Churches, there are many wall paintings and mosaics of the Madonna and Child. 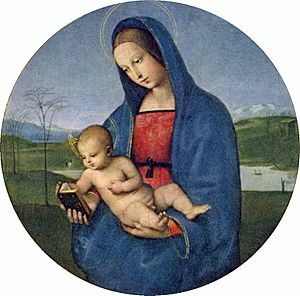 Most Madonna and Child paintings are small. They have been painted for private owners and would usually have been kept in houses. They might be hung on the wall above a table where flowers and candles could be placed to honour the Virgin Mary. Most of the famous ones are now in art galleries. Statue of the Madonna and Child, Abbey of Fontenay, Burgundy. Many Catholic churches have statues of the Virgin Mary with the Christ Child, These are sometimes life-sized and are painted, with real hair and glass eyes so that they look lifelike. Other statues of the Madonna and Child are very small. In the Middle Ages small statues were carved from ivory. These precious statues are often very beautifully and delicately made. They can often be seen in museums. In Florence in the early 1400s, an artist called Luca della Robbia began making terracotta statues and sculptured altarpieces from clay, which were fired and glazed with colours, most often blue and white, but also purple, green and yellow. This family business lasted for 120 years. In the Orthodox Church, there is also a long tradition of painting images of the Virgin Mary with the Christ Child. These pictures, which are often quite small and are painted on wooden panels, are often very careful copies of particular famous icons. This tradition continues to the present day. by Cimabue, c.1270, Florence, now in the Louvre. 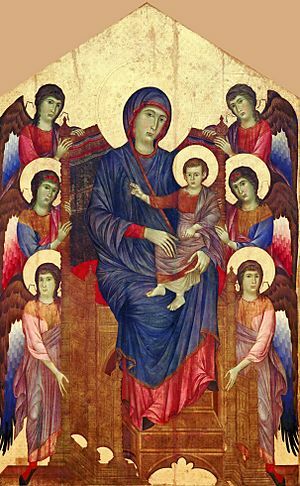 The Maesta, the Madonna in Majesty by Duccio, c.1308. Duomo Museo, Siena, Italy. These three famous paintings are all together in one room of the Uffizi Gallery in Florence. Two of these paintings are from the Middle Ages, but Giotto's painting is an Early Renaissance painting, as can be seen in the natural, solid look of the figures which seem to be three dimensional. The Madonna of the Rocks by Leonardo da Vinci. There are two paintings. One is in the National Gallery, London, the other one is in the Louvre, Paris. The Sistine Madonna by Raphael, in the Vatican Museum Art Gallery. This little painting by Raphael is in the Hermitage Museum. The Wilton Diptych. This very rare painting from the Middle Ages was probably done in England and is in the National Gallery, London. The Madonna of the Magnificat, by Botticelli, Uffizi. The Doni Tondo, by Michelangelo, 1505, Uffizi. Raphael did many of these small paintings. They can be seen at the National Gallery, London, the Uffizi, the Louvre and many other art galleries. Many churches contain famous statues of the Madonna and Child, particularly old churches. The Virgin of Notre Dame Cathedral, Paris. This Madonna is carved of stone. The Moorish Madonna of Sant' Antonio's Basilica, Padua. This Madonna has dark brown eyes and olive skin. 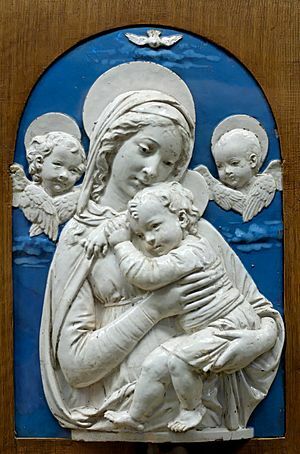 Many carved wooden Madonnas of the Middle Ages and many terracotta Madonnas by the dell Robbia family can be seen in museums. The Virgin of Vladimir. 1131. This famous icon from Constantinople (modern Istanbul) is kept at the Tretyakov Gallery Moscow. There are many copies of it. 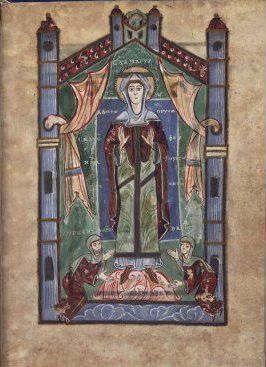 The Virgin of Chilandari, c.1360. Mount Athos, Greece. This painting which is very badly damaged, is famous for its beauty. This well-loved picture by the Spanish artist Murillo is in the Pitti Palace Gallery in Florence. This painting is called the Madonna of the Sunset because the sun shines on its gold background in the afternoon. Mary and baby Jesus are talking about St Francis of Assisi. Madonna and Child Facts for Kids. Kiddle Encyclopedia.